The world’s news media is focused on efforts to find and rescue young women kidnapped from their school in Nigeria—a nation plagued by terrorist violence that claimed more than 1,000 lives from December 2013 to May 2014. 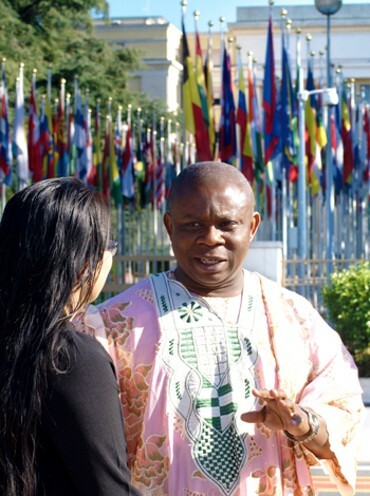 A strong voice working to bring peace and human rights to Nigeria and the surrounding region is Bishop Chidiebere Ogbu, a Youth for Human Rights partner and founder and president of the IMPACT Africa Network, whose mission is to uplift and empower African communities through human rights education. His work has taken place in the teeth of such adversity that he once narrowly escaped a bomb blast intended for him. What is the importance of the Universal Declaration of Human Rights in Africa today? Everyone needs to know and understand the 30 human rights of the Universal Declaration, just as Christians know the Ten Commandments. This is essential. When people know them in their hearts, in their minds, I guarantee the world will be at peace. We all know the laws exist. Now it is time to get them implemented, and that requires dedicated action from individuals. How did you become a partner with Youth for Human Rights International? It was the Church of Scientology that opened those doors for my organization and for me. When I wanted to reach out to other ministers of the Gospel or other individuals and groups, they made sure I had access to educational materials—human rights booklets, DVDs, everything. To Scientologists, it’s not about talking; it’s about the implementation, the action. That’s why I call the Church of Scientology the action church. The Church also encouraged me to attend the Youth for Human Rights Summit in Geneva, where I was amazed to see youths from many and diverse countries all coming together in the campaign for human rights. I saw them presenting what they had been doing, not just talking, and I was impressed and I was inspired. What is a specific activity that can improve human rights in Africa? University students and others see what we do and ask how they can be part of it. I say they can form human rights clubs—in every institution, in every municipality. We plan to establish human rights clubs everywhere, in schools, in organizations, in every community. And if we do this, we will go very far. Why are you so dedicated to mandatory human rights education in schools? Human rights must be taught in schools as I believe we can change nations in one generation. People hear “human rights” but they don’t understand what a human right is and how it connects to their life. Without that basic understanding of human rights, they do not see what it means for people to respect one another and the strength for the community and the nation that comes from knowing and respecting human rights. What are the challenges of implementing human rights education in Nigeria? In terms of human rights, Nigeria is far behind. There are too many human rights abuses, so IMPACT Africa Network is working very hard. The major victims of human rights abuse are immigrant women. They are raped, they are abused, and nothing is being done about it. We are educating the Nigerian population to change this. The materials from Youth for Human Rights have been extremely effective. What is the next step in your educational efforts? We put Nigeria in the center stage, the most populous African nation. Then Ghana, Cameroon, the Republic of Benin and others—they have to see that human rights education, grassroots clubs, can work.